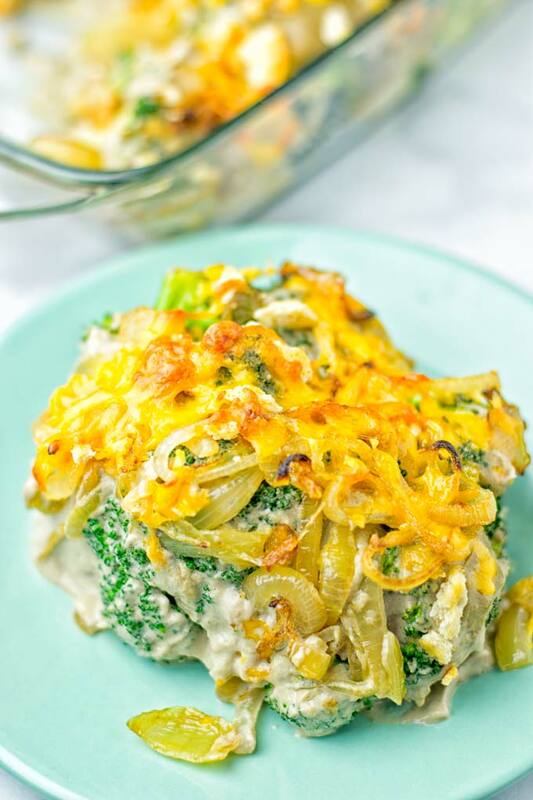 This Vegan Broccoli Casserole is made with a cream of mushroom soup and is a perfect 30 minute meal. 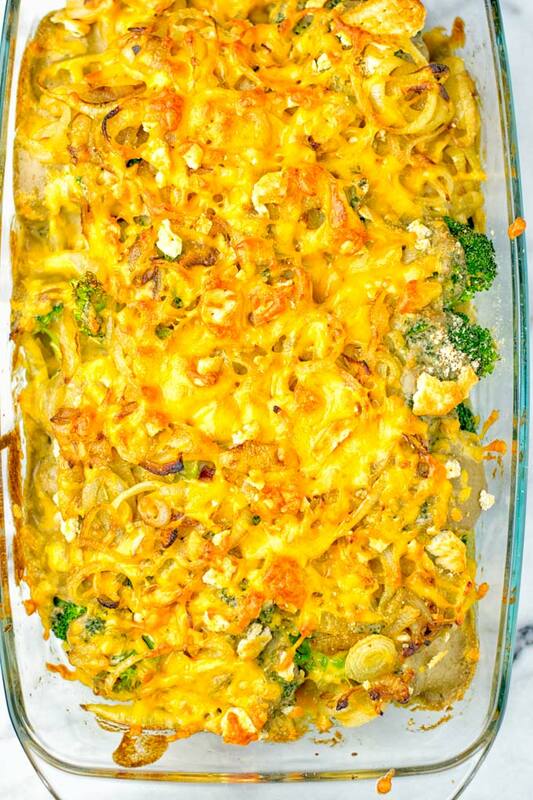 Nothing screams more comfort than a fresh broccoli casserole and no one would guess it’s dairy free, can be even made gluten free if needed. Seriously one of those easy dinners recipes for families or lunch ideas for kids that you will come back to again and again. You know I love to make my vegan casserole recipes so that no one would ever believe that they are vegan. Making them taste so real like in this Mexican Street Corn Potato Casserole or my Eggplant Parmesan Zucchini Casserole. 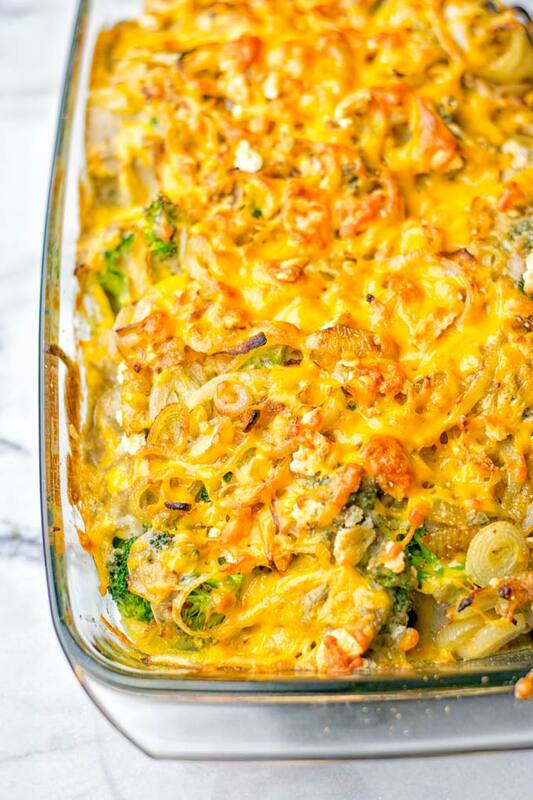 This Vegan Broccoli Casserole is no exception: it is creamy, cheesy, satisfying, addictive, mouthwatering, super easy to make, filling, and high in flavor. Before we’re going into it, I tell you directly: if you’re are looking for a healthy broccoli casserole this is definitely not it. But if you’re looking for the best broccoli casserole that you ever made and tasted, you’ve come to the right place, friends. 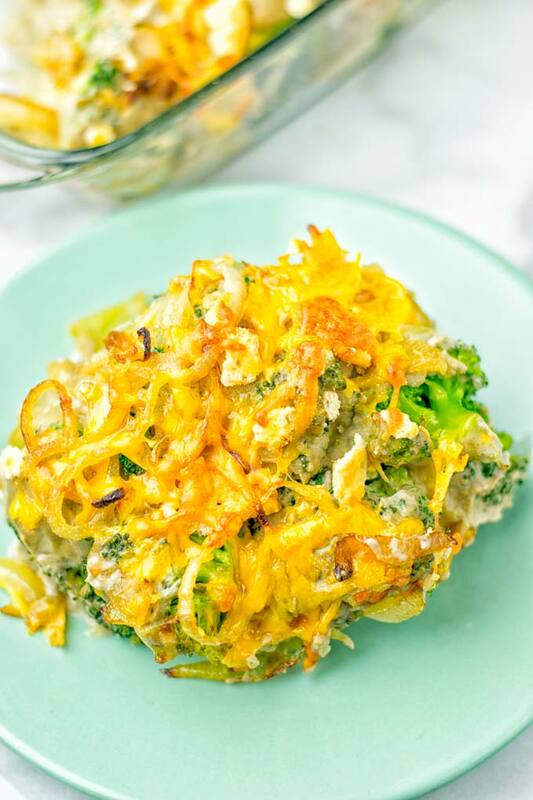 Let’s have a look at the ingredients, so you know what this Vegan Broccoli Casserole is made with: You will need two broccolis cut into florets, steamed or cooked. Next you will need vegan butter and again onions and finally vegan cheddar. All of this comes together with my Cream of Mushroom soup which you have already prepared homemade (without the chickpeas and no need to reserve mushrooms): This time you will use the whole amount of mushrooms for the soup. In a pot heat a bit of oil, add onions, minced garlic, and after 5 minutes add all the mushrooms. Fry more. Add in the following coconut milk, nutritional yeast, and vegetable bouillon. Pay attention to just use the powder, no liquid needed. Finally, transfer everything to a blender and process until smooth and creamy, ready. Set aside. Note: if you’re not using my mushroom soup recipe, make sure to adjust the seasoning. Add more garlic, salt, pepper whatever you like to guarantee a more tasty and flavorful result. Otherwise it could turn out a bit bland and boring. Another advice: you may use the optional potato starch to thicken up your soup. Mix in a small bowl with water and give it to your can of soup. Mind that this step is not needed for my homemade soup recipe. Optional: you can add paprika spice for more flavor, crackers for more texture, and vegan mayonnaise for additional creaminess. What’s not to love about this quick and easy dinner! First preheat your oven to 410°F. Heat a large pot or pan with vegan butter. Fry the onions for around 5 minutes until golden. While you do this, mix potato starch with water in a small bowl, if you plan to add it. Next add the prepared mushroom soup and optional vegan mayonnaise. Cook everything until thick and creamy for around 2 minutes, turn heat off. For the final step, you need a 13×9 inch casserole. Fill it with the steamed or cooked broccoli, season with a pinch of salt and pepper. Sprinkle with the optional paprika spice and then mix with the cream of mushroom sauce. Finally top with vegan cheese and again totally optional crushed crackers. How many times do you ask yourself what to make for dinner? 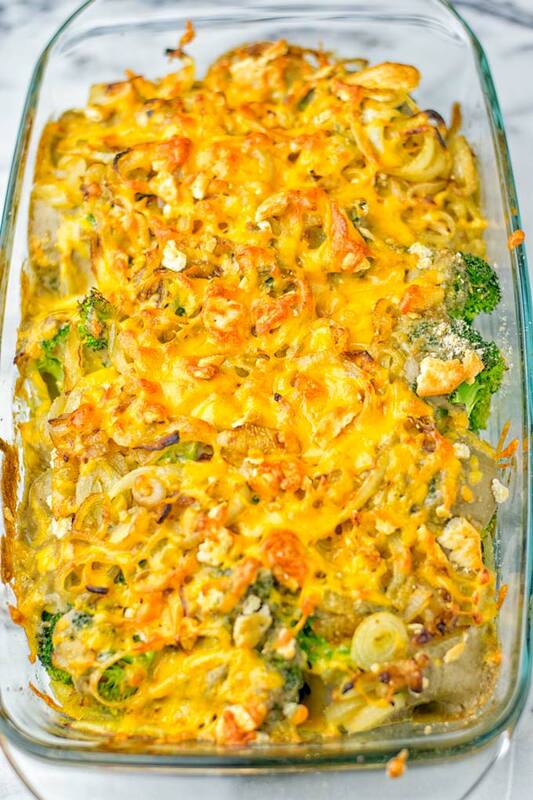 This Vegan Broccoli Casserole it is for dinner, lunch, meal prep and so much more. It’s the epitome of comfort food for everyone, no matter if vegan or not. Everyone in your family will agree. Meat loving husband, picky kids, vegetable hating daughter – if you serve this you will be the star of the show. I’m sure they will ask you to make it over and over again. As I mentioned before if you use another mushroom soup from the can, to save time please add more seasonings to make it more flavorful. If you use my cream of mushroom soup there isn’t any need for more seasoning it’s full of amazing flavors. 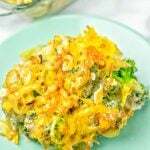 Need more variations looking for a broccoli casserole without soup? Just add more optional vegan mayonnaise, just fry the onions and mix everything in a 13×9 inch casserole together. No need for potato starch. 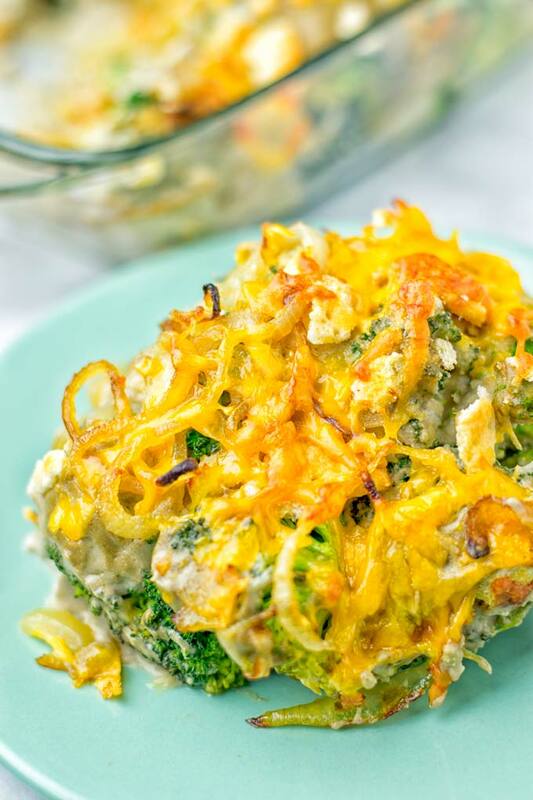 To make a broccoli rice casserole: simply add 1 cup cooked rice to the the vegan broccoli casserole. Garlic Broccoli Stir Fry – one pot meal and oven version! Cashew Curry Broccoli Stir Fry – super creamy and ready in 25 minutes! 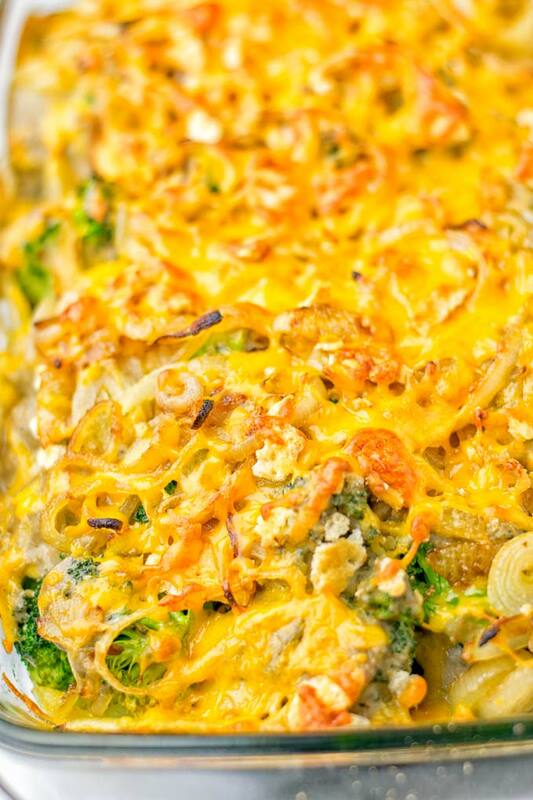 Give this Vegan Broccoli Casserole a try and you will know you will obsessed with it. Tag me on Instagram and Facebook. Snap a picture so I can see all your amazing remakes. Heat a large pot or pan with vegan butter. Fry the onions for around 5 minutes until golden. While you do this, mix potato starch with water in a small bowl, if you plan to add it. Next add the prepared mushroom soup and optional vegan mayonnaise. Cook everything until thick and creamy for around 2 minutes, turn heat off. For the final step, you need a 13×9 inch casserole. Fill it with the steamed or cooked broccoli, season with a pinch of salt and pepper. Sprinkle with the optional paprika spice and then mix with the cream of mushroom sauce. Finally top with vegan cheese and again totally optional crushed crackers. If you’re not using my mushroom soup recipe, make sure to adjust the seasoning. Add more garlic, salt, pepper whatever you like to guarantee a more tasty and flavorful result. Otherwise it could turn out a bit bland and boring. You may use the optional potato starch to thicken up your soup. Mix in a small bowl with water and give it to your can of soup. Mind that this step is not needed for my homemade soup recipe.